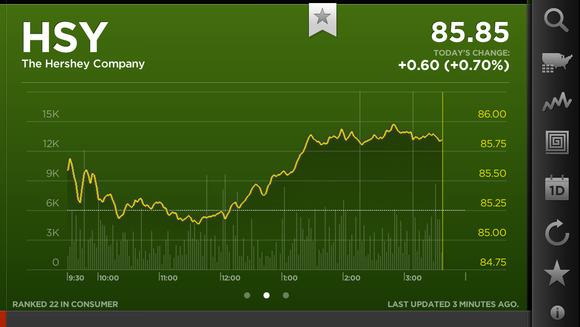 StockTouch is a colorful, creative alternative to Apple’s stock Stocks app. 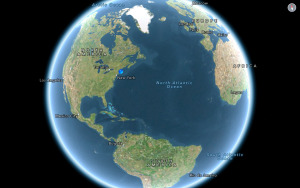 The free StockTouch app works on iPhones and iPads alike. The app works only in landscape mode, which is annoying—at least on the iPhone—but not a deal-breaker. 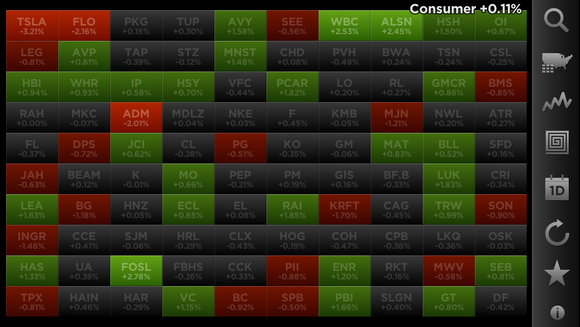 Its default view is a colorful chart of stock performance, grouped by sector. You can tap into, say, Consumer or Technology funds as desired. 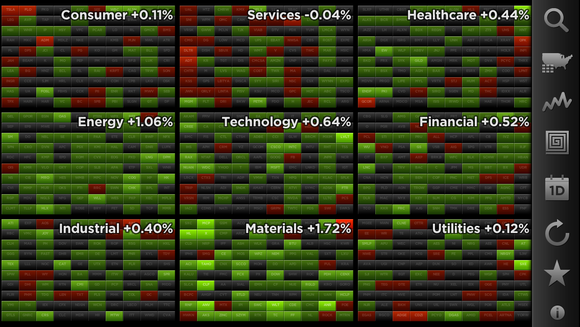 Each sector is made up of tiny icons representing stocks’ relative performance. Tap on any individual stock, and you can see all the market-related stats you’d expect, along with charts and recent news related to the company in question. You can swipe through that overview screen to see a larger chart or more news stories. You can mark funds you care about most as favorites by starring them. Those stocks then get visually highlighted in StockTouch’s colorful default view, though you can also instead switch to a view that only lists your favorites. Disappointingly, there’s no way to view your favorite stocks’ performances in a list view—akin to Apple’s Stocks app—which makes reviewing your own investment performance take a bit more tapping than it ought to. Save for that one omission, though, StockTouch feels very complete; the app is highly customizable. You can choose to view U.S. stocks, global stocks, or your favorites; you can choose to view stocks by price change, volume, PE ratio, dividend yield, or vs. the S&P 500 or the sector; you control how stocks are sorted; and so on. All told, StockTouch is powerful, colorful, highly customizable app. If you’re looking for a different approach to iOS-based stock management, it’s worth taking a look at. StockTouch is powerful, colorful, highly customizable app. If you're looking for a different approach to iOS-based stock management, it's worth taking a look at.